Parents of children with autism living in a rural state face unique challenges based on their location. These include barriers to diagnosis and treatment, driven in part by scarcity of professionals familiar with autism and long distances between services providers and family residences. Instead of focusing on these barriers, which are well known and researched, we utilized a strength-based technique known as Appreciative Inquiry (AI) to inquire how parents view and experience success for their child with autism in a rural state. Our investigation was conducted with 22 parents of children with autism ranging in age from 30 to 60 years using semi-structured interviews. Data were analyzed using thematic analysis. Results of our analysis indicated that parents envisioned and promoted success for their child over time through: (1) developing skills, (2) integrating (their) child into community, (3) building relationships, (4) advocating by parent and child, and (5) adapting to their new reality. Our findings showed that parents in a rural location define success based on their existent resources and support systems provided by clinicians, school personnel, and most importantly, support from the larger community (e.g., other parents). Parents in our study showed that behavioral interventions are not the only solution. RLS: Executed the study and did the data analyses and wrote the study manuscript. EJM: Designed the study and collaborated on the writing and editing of the study manuscript. BR: Executed the study and collaborated on the writing and editing of the study. EBS: Transcribed the interviews and collaborated with RLS on the data analysis and writing and editing of the study manuscript. The University of Wyoming Institutional Review Board reviewed and approved this human subjects study. Informed consent was obtained from each parent participant in this study before data collection—interviews were conducted. Baio, J., Wiggins, L., Christensen, D. L., Maenner, M. J., Daniels, J., Warren, Z., . . . White, T. (2018). Prevalence of autism spectrum disorder among children aged 8 years—autism and developmental disabilities monitoring network, 11 sites, United States, 2014. Morbidity and Mortality Weekly Report Surveillance Summaries, 67, 1. doi: https://doi.org/10.15585/mmwr.ss6706a1. Gallagher, S., & Whiteley, J. (2013). The association between stress and physical health in parents caring for children with intellectual disabilities is moderated by children’s challenging behaviours. Journal of Health Psychology, 18, 1220–1231. https://doi.org/10.1177/1359105312464672. Koegel, L., Matos-Freden, R., Lang, R., & Koegel, R. (2012). Interventions for children with autism spectrum disorders in inclusive school settings. Cognitive and Behavioral Practice, 19, 401–412. https://doi.org/10.1016/j.cbpra.2010.11.003. Lovaas, O. I., & Smith, T. (2003). Early and intensive behavioral intervention for autism. Evidence-based Psychotherapies for Children and Adolescents, 325–340. doi: https://doi.org/10.1016/j.rasd.2008.08.008. McIntyre, L. L., & Brown, M. (2016). Examining the utilisation and usefulness of social support for mothers with young children with autism spectrum disorder. Journal of Intellectual & Developmental Disability, 1–9. doi: https://doi.org/10.3109/13668250.2016.1262534. Mello, M. P., Urbano, R. C., Goldman, S. E., & Hodapp, R. M. (2016). Services for children with autism spectrum disorder: comparing rural and non-rural communities. Education and Training in Autism and Developmental Disabilities, 51, 355. https://scholar.google.com/scholar?q=Mello%2C%20M.%20P.%2C%20Goldman%2C%20S.%2C%20Urbano%2C%20R.%20C.%2C%20%26%20Hodapp%2C%20R.%20M.%20%282016%29.%20Services%20for%20children%20with%20autism%20communities.%20Education%20and%20Training%20in%20Autism%20and%20Developmental%20Disabilities%2C%20in%20press. Accessed 10 March 2018. Parikh, C., Kurzius-Spencer, M., Mastergeorge, A. M., & Pettygrove, S. (2018). Characterizing health disparities in the age of autism diagnosis in a study of 8-year-old children. 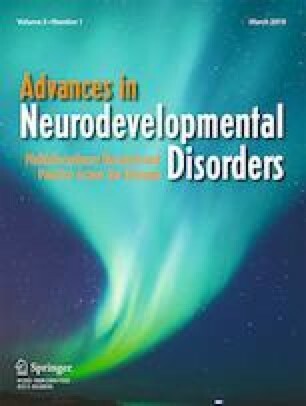 Journal of Autism and Developmental Disorders, 1–12. https://doi.org/10.1007/s10803-018-3500-6. Patten, E., Baranek, G. T., Watson, L. R., & Schultz, B. (2013). Child and family characteristics influencing intervention choices in autism spectrum disorders. Focus on Autism and other Developmental Disabilities, 1–9. https://doi.org/10.1177/1088357612468028. Pepperell, T. A., Paynter, J., & Gilmore, L. (2016). Social support and coping, strategies of parents raising a child with autism spectrum disorder. Early Child Development and Care, 1–13. https://doi.org/10.1080/03004430.2016.1261338. Reichow, B., Barton, E. E., Bo,,yd, B. A., & Hume, K. (2012). Early intensive behavioral intervention (EIBI) for young children with autism spectrum disorders (ASD). The Cochrane Library. https://doi.org/10.1002/14651858.CD009260.pub2.